Thekchen Chöling, Dharamsala, HP, India. March 13, 2018 – As is his custom, His Holiness the Dalai Lama walked from his residence to the Tsuglagkhang this morning, stopping to talk to people on the way. In the temple he first paid his respects before the statue of the Buddha then turned to greet those gathered for the Mind & Life conference, asking them how they slept and declaring that he had slept nine hours. Among those he greeted personally was his principal physician from the Mayo Clinic. Today’s moderator, Tony Phillips, welcomed His Holiness and thanked him for his time. He explained that this morning three presentations would show how education of the heart is transforming education in actual practice, on the basis of His Holiness’s advice. First to speak was Kimberly Schonert-Reichl, who began her career as a teacher but became a scientist who now has 30 years experience working in Social Emotional Learning and Collaborative for Academic, Social, and Emotional Learning (CASEL). Children who have benefited from these programs are found to have higher kindness behaviour and academic achievement, as well as less aggression and emotional distress. What’s more, as SEL becomes more popular around the world, by 2017 it had become part of the accepted education system in 50% of states in the USA, involving 1.5 million teachers and 25 million students. The result is that students are now commonly learning not only how to read and do maths, but also how to deal with their emotions. SEL, with the introduction of core competencies, has become an integral part of education in the Canadian province of British Columbia. Schonert-Reichl also spoke about MindUP, an SEL program for students from KG to grade 8, in which they also learn about the brain and learn to practise gratitude. Monitoring of students’ progress shows they have greater attention and less stress. Their tendency towards depression decreases, while their kindness increases. They willingly share, and prove themselves to be helpful and trustworthy. They are included in the science of the program receiving explanations of what is happening and why. Referring to His Holiness as a force for change and a force for good in British Columbia, Schonert-Reichl offered her thanks. Sophie Langri and Tara Wilkie next explained how the five core competencies of self-awareness, self-management, social awareness, relationship skills and responsible decision making are implemented within three domains—ME, YOU and US. Within the ME domain it’s explained that emotions have different energy. Anger and excitement, for example, have high energy and 5 year olds can be taught to recognise and name 15 feelings associated with emotions. They also learn about their needs in terms of corresponding human values with which they can regulate their emotions. This is how even very young children can be taught about emotional literacy. In the YOU domain children learn both about difference, but also about conflict resolution, which takes place on the basis of human values not emotions. In the US domain a sixth component has been added—appreciating interdependence. In this context children learn the importance of kindness to themselves and to others. They practise working together on projects. Wilkie told an illustrative story of a little girl trying to complete an assignment in a hurry who lost her temper and said a bad word. She was taken to the principal’s office, but continued to be upset. Shown a chart of feelings she was able to identify her feelings as anger and sadness and her need for kindness. A short film clip of young children working in the ME domain showed them not only learning, but also clearly enjoying it. The moderator commented that what had been shown so far was that SEL is becoming fully integrated into school systems, with students, teachers and parents all involved. He remarked that there is not only a need to educate the heart, but also to educate the system. “I really admire how you are implementing these changes,” His Holiness responded, “and observing the changes in children that come with them. I think our entire 7 billion human beings need to develop a greater sense of US. And I wish that international bodies like UNESCO would take up these approaches. As well as in the US and Europe, we need to see them applied in the Middle East, Africa and other places. We need to share this experience with countries facing serious problems. Kimberly Schonert-Reichl remarked that the OECD has an Education 2030 program that aims to help countries find answers to what knowledge, skills, attitudes and values are needed for today’s students to thrive and shape their world. Richard Davidson, who is involved with UNESCO himself, introduced colleagues working out of Delhi. “The conflict between Israel and the Palestinians affects the whole Middle East,” His Holiness added. “Most Israelis are well educated. On one visit to Israel, I was the guest of a Jewish group so to begin with I heard everything from their point of view, but when I met Palestinians a few days later, I heard their side and there is a huge gap between them. Later, I also met a group of both Israelis and Palestinians who were working towards reconciliation, which is crucial if there is to be peace in the region. No matter how powerful Israel may be, these people have to live side by side, they have to live together, so it would be better to live in harmony. “When I went to Jerusalem, I noticed that the Israeli areas were lush and green, while the Palestinian lands were dry. It seems the Israelis are very efficient in their use of water. How much better things would be if their expertise was shared. The session broke for tea. When participants reconvened, Jennifer Knox of Emory University talked about her work with Social Emotional and Ethical Learning (SEEL), including an additional ethical component, with older children. She spoke, as a teacher, artist and mother, about cultivating basic competencies within a structure of three domains—awareness, compassion and engagement—and three dimensions. She mentioned that as well as the usual competencies another—appreciating interdependence—was also added. She showed a video clip of students talking about dealing with emotions. She stressed the importance of their understanding that they have a choice. She also emphasised the need for an approach that takes place in a culture of compassion. 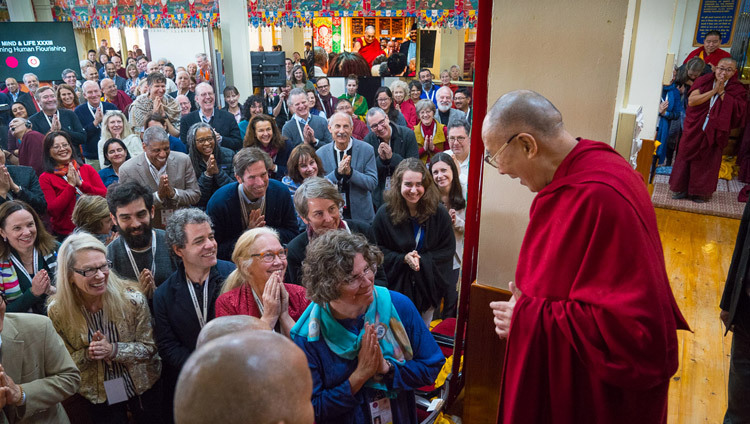 His Holiness picked this up, noting that when we talk about compassion it has to include having compassion for yourself. It’s not just a matter of self-sacrifice. He remarked that he has observed a foolish sense of selfishness and a wise sense of selfishness. Since we are social animals, who depend on one another, to show love and compassion to others is wise. His Holiness mentioned his old friend Richard Moore who as a ten year old was blinded by a rubber bullet in Northern Ireland. When he regained consciousness and found he was blind he wasn’t angry, he expressed regret only that he could no longer see his mother’s face. Moore met the soldier who shot him. They became friends and now work for the welfare of children in conflict zones. His Holiness regards Moore as his hero because he has responded to his own hardship with compassion for others. As the morning’s presentations came to an end, Thupten Jinpa invited His Holiness to advise what else needed to be done. His Holiness responded that he had not much to say other than to make clear his deep appreciation for the programs he’d heard about and his hope and wish that it will be possible to increase and extend them. As the session ended, His Holiness made his way slowly down to the temple yard where a car was waiting to drive him home. He will attend another morning meeting tomorrow.